This design has been build several times. When ordering materials, you get 10% discount. This can be when you order it all together, or when you order some parts later too. Like upgrade to Yamamoto sockets, etc. This is not done automatically, so please ask for it when ordering and it will be processed with 10% discount. Resistors we don't sell. Capacitors only when there is an order number for it, in the parts list (all below here). Though not on the parts list, consider the transformer caps from Lundahl, these are from magentic shielding steel, and also these caps can be opened while mounted, and you can work or measure on the wiring. They're really convenient, and very good looking transformer caps, powder painted so they won't scratch, and with decent Lundahl logo on it. This is a beautiful housing made by Anastas Kilda from Lithania. Please note, you need to build a housing yourself. Please read some more feedback here. The schematic is drawn for a ground bar. In case you want to use a wooden housing, you need to use a star grounding and a metal deck plate, and it will work just as nice. Star ground is more complicated to wire than a ground bar, but for a metal chassis a ground bar is just perfect. For a star grounding, use one ground star in the power supply, and a second one in the amplifier. The power supply ground star is at it's output. The amplifier ground star is at it's input, and is grounded to the metal plating. The power supply ground star is kept floating. Like this, there can be no ground loop, which is why we do this. Ground star wiring is not needed for a closed metal case, though also for a metal case. Both star grounding and a ground bar prevent ground loops. Note: A ground loop is like one 'transformer winding' so it can pick up magnetic hum from external fields. Such fields can be caused by the power supply wiring, but also in extreme cases by equipment or mains cables, even the cabling in the wall of the house. Preventing ground loops is not difficult, but it requires some minimum effort. A potentiometer is used at the input of this amplifier. Of course you can removed if when you don't want to use it. In that case it is recommended to change the grid resistors on pin #4 of the 6SN7#s to 10k. However many pre amps today produce far to much signal, so it may be a good idea to have a volume control on this 300B amplfifier. Like this you can adapt the amplfier's sensitivity for maximum output signal at '100%' volume at the pre amplifier. First, this will give more convenient volume control at the pre-amp. Also, this will reduce the overall noise of the system, when the pre-amplfier is of a somewhat noisy type, which can be the case with tube pre amplifiers. This method of noise reduction really works, and cost only a potentiometer. The pre-amp and driver circuit of this amplifier is a classical one, as can be found in several historic amplifiers in more or less the same way. It has been modified very minimal here, to make the plate current of the 6SN7 tube halves the same. DC Coupling requires the bias of the pre-amp tubes totally correct, since that sets the bias of the driver tube. For that reason we used a meter to check the bias of ALL tubes. We are using the Yamamoto Ampere meter, which is of a type that is not in the signal path. This gives us also the possibility to test the bias of all tubes. With DC coupling, the bandwidth of the driver stage is better, and we save the coupling capacitor from pre-amp to driver. In the 1920's a similar circuit was patented as the Loftin White. The End Stage is designed with a vintage working point of the 300B. As you may know, best sound and highest output power do not go together with tubes, and most specially with the 300B this is so. Amplifiers 'on steroids', designed for maximum output power, don't have the softness of a single ended triode. It is this disappointment which makes people use 2A3 tubes or even Type 45 tubes in the end. However when a 300B is biased just moderately, a less dominant sound of this tube will develop. So the idea is here to get a nice and sweet sound in the first place. The result here, is an honest 7.1 Watt RMS , at the output of the transformer. This will need speakers with 91dB or better. Low Hum is achieved by DC heating of the 6SN7. Also good and correct wiring is needed to get the hum at or below 1mV, but this is possible with normal effort. See the additional notes at the power supply for this. 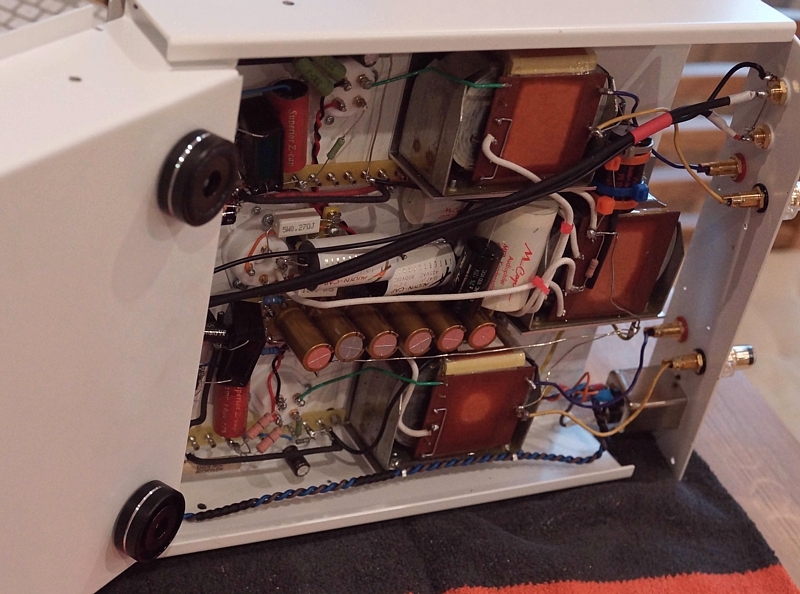 The mains power supply uses also a Lundahl transformer, which is in it's base construction the same as a tone transformer, so it is not a low budget mains transformer. Advantages are extremely low hum, virtually no stray radiation, and very low heat loss in the transformer. For the rest we have to say this power supply has a special capability to reject a small DC component as sometimes present on the mains. Low cost mains transformers can be found for half the price of a Lundahl, but that would be saving money at the wrong end. 115V or 230V. I have shown a nice way how the transformer can be wired quickly for 115V or 230V by adding one or two bridges on a five pole solder strip, but of course you can hard wire it directly to the right mains voltage as well. As Power Supply choke, we use the Lundahl Dual Coil chokes here at the finest of their possibilities. it is called the Common Rejection Mode, so the choke is used as a 1:1 coupling element, short circuiting common mode signals, and bypassing differential mode signals. So it is signal filter and power supply choke at the same time. A miracle, nobody ever patented this. This is a choke with two 5Henry coils on one core. The outgoing DC current is passing through one coil of the choke, and the returning current through the other coil. The DC signal is serialized, but the AC stray field (called 'loss induction') is in anti phase for each coil which results in lowest hum possible. For calculations, this makes the choke act as 10Henry choke. For the tube rectifier an electrical symmetry point is created with two silicon diodes. I quote Per Lundahl's words here, that such a center tap will prevent mechanical hum, since it will per definition divide the transformer flux over two windings, at the moment the mains makes one half cycle. So it means if there is the positive cycle, the current flows still through both transformer halves still. Same for the negative cycle, but in the other direction of course. Still each cycle passes the rectifier tube the normal way. This will give a dead-silent operation of the main transformer. Try out the current path, and you will see! The rectifier tube used here is 5U4G mesh by Emission Labs, or with another socket you can use 5Z3 mesh from Emission Labs. It is very interesting to replace rectifiers by different types! Theoretically this makes no difference, but from blind hearing tests I once did with the Luxembourg Audio Note distributer, I changed my opinion. We did hearing test on the Audio Note, Mei Shu, 300B Amplifier, and we changed the rectifier 5U4G to 5U4GB. The difference was audible, neither tube sounder better than the other, but they do sound different. It was sure to use good, new rectifiers, that I brought myself and tested before. So since then, I speak against my engineering knowledge, and I say yes, rectifiers do have influence on the sound. So I always encourage people to try some different kind and difference brands. In this amplifier published here, you can use 5U4G, 5U4G, 5Z3, 5X4. These are all different tubes. 5U4GB (so with the suffix 'B') can withstand a higher first capacitor, which option we do not use here, so 5U4GB and 5U4 can simply be swapped. 5Z3 has a four pin UX4 base, same as 300B, but for the rest it is identical to 5U4G. 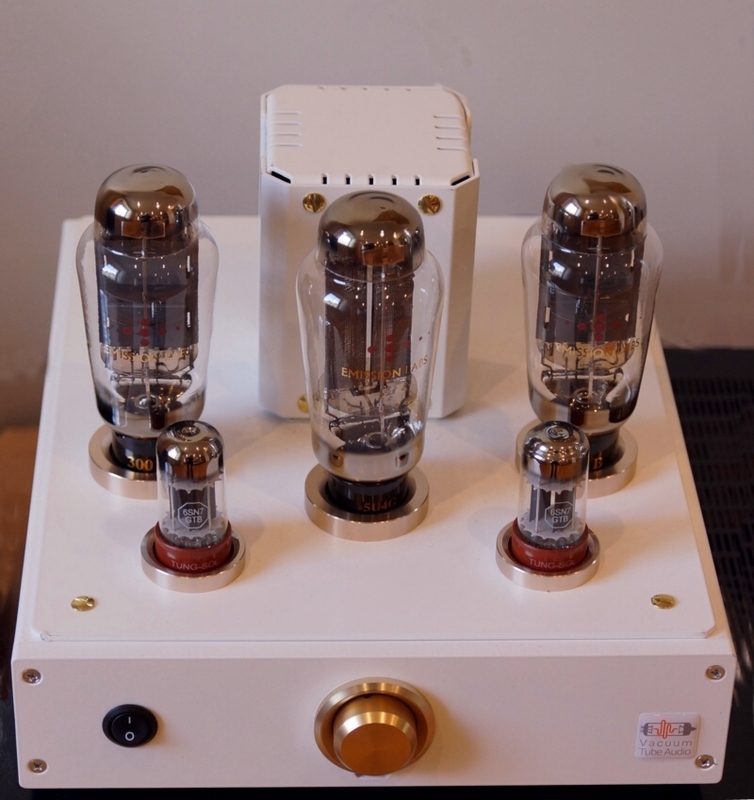 The tube 5X4 has an octal base, a difference pin out as 5U4G, but for the rest it is identical. Even so, it is possible to wire an 8pin Octal socket such that you can fit in 5X4 or 5U4G. Mains voltage control is important for good tube life. Since we already have the Yamamoto meter and a switch installed, we can conveniently check the mains voltage with just two more resistors. Control of mains voltage is getting more important, sine quality of the mains is going down each year slightly. A mains voltage of so called 230Volt can as well be 218Volt or 238 Volt depending on the hour of the day, and the place where you live. The Yamamoto meter has a full scale of '100'. So you can calibrate that reading for '100' when you have 100% mains voltage, and then automatically it will indicate '95' when you have 95% mains voltage. 5% deviation is the limit for all tube amplifiers. Calibration of the Mains voltage control can be done with any mains voltage you have at the moment of calibration. You switch on the amplifier, and measure the mains voltage inside the amplifier. Then take your calculator and calculate that in percent. For instance the mains voltage you find is only 95% of what it should be. Now set the meter for '95' and it is calibrated. Sound: Please do not ask by an email description about sound, but a little but we can say. The driver stage is low noise schematic, and the heaters are all with DC. So when you build it nicely, and also use the hints that are in the schematics, this amplifier has almost inaudible noise or hum. The SE transformer by Lundahl is a very good one, and it is possible to get this amplifier fully flat in the audio range from 20Hz to 20kHz, so at zero loss. The pre amp and driver are made with 6SN7, best described as 'What goes in, is what comes out. So no coloring of any kind. All you are listening to is the 300B and the SE transformer iron. (And yes, a transformer has it's own sound). The bias of the 300B is chosen relatively low at only 22 Watt. Yet this is a remarkable good working point, and a beautiful sounding 7 Watt will result from this. 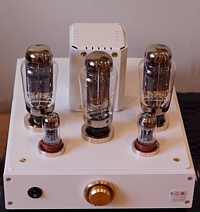 This lower power will take away the 'dominant' sound any 300B will have at higher dissipation, so sound at 22 Watt dissipation becomes a bit sweeter, more triode like. Another advantage is the possibility to use EML 300B-Mesh here. At 22 Watt this is the perfect working point for this tube. The higher transparency of (real) mesh tubes will amaze you, provided you have high quality speakers which can reproduce this. Good functioning and power supply considerations: This schematic is free service only. Please understand, for legal reasons we must say, we do not guarantee the schematic. However it has been build by several users, performance with the Lundahl SE and Mains transformer is very good. If there a problem when building it, please contact me by email, and I am sure we can solve this, as functioning of the schematic is very logical. What you do need to have a look at, is the values of the capacitors C7, C14 and C15. You need correct voltages of B1, 390Volt and B2, 435Volt. The power supply configuration is mixture of choke loaded and capacitor loaded. Which means the first capacitor is chosen much smaller as with a capacitor loaded circuit. The result of this is, the value of C7 has a large influence on the DC output voltage. For this reason you can not use an electrolytic type for C7, and such have -30...+50% tolerance over time, which would drastically change the output voltage. For C7 you need to use a foil cap, as value of those do not change. Use a self healing type, such would be the Mundorf MCaps, Mundorf Supreme, Mundorf Silver Oil, and many others. The value of capacitor C7 can be changed, to adjust B2 to 435 Volt. (Then, B1 will be automatically 390 Volt). As the value is relatively low, you can conveniently use low cost MKP foil capacitors. 1uF 630V costs appr 3 Euro. WIth a few those you can find the right value needed, which depends on some variables like your mains voltage precision. This is also needed to adapt better to the rectifier of your choice. When you have found the exact value, you can decide to leave it as is, or replace it by one of the upgrade type like Silver Oil Caps. The value of capacitor C14 can be changed, and 22uF is a good minimum value. Some people take a higher value. It is for convenience and safety we choose 630Volts here, so there is no risk of over voltage. If you want to use Electrolytics, 500 Volts types should be ok. The network at the choke output is a low pass filter, as you should feed the driver stage and the end stage from the same power supply. This filter passes only the DC current, but no audio signal ripple from B1. For that reason the exact value of C15 is not so important. As now, 3.9uF is fine, but can increase it to any higher value, and this will not change the voltage B2. Alternatively there are now Mundorf so called Tube Caps for sale, these are new technology foil caps, that have chemicals inside, similar as electrolytics. This gives still a real foil cap (so connections can be reversed) but significantly smaller dimensions, and very low internal resistance. So to say they combine the virtues of Electrolytics and foil caps. This technology was introduced silently, but indeed this is new kind of capacitor, intended for power supplies. They do very small leakage, 1uA or so, comparable to paper in oil caps, which is irrelevant for a power supply, but it makes they not ideal as coupling caps. They are available in very few values only, so these are good when you need basically just a high value. Like 100uF 550V is large but acceptable size and acceptable price too. Wheras such MKP Caps are too big size. . For C14 an Mcaps would be a nice choice. The typical Lundahl 'CMR' topology for the choke is not new. The nice part if this is, it seems to isolate the rectifier part from the capacitor part better, because there is also a choke in the ground circuit. Yet, this can be wound on one core, and we loose no inductance, as long as the DC path of each choke is choosen correct. (Just use our schematic, and connect pins 1,3,4,6 of the choke this way). Note, this circuit is almost like choke loaded, as the first capacitors we choose very small. The Kaneda circuit does this as well, though you may see 'large' capacitors, but the Kaneda is a low voltage circuit. Yet, the idea can of course easily be adapted for high voltage too. For the choke used (T4) we definitely recommend a Lundhal, or any other type that can be used choke loaded. Being able to use it like that, is a quality element of any choke, and such chokes give no audible mechanical hum, also not after longer time. Low cost chokes will work initially, but choke loaded means higher mechanical (resonance) force on the windings, and if they becomes loosened over time, some mechanical noise will appear. This is no real defect, but it is annoying. Note, the choke is connected here in so called CMR configuration. You will find more information about this in the Lundahl Tech corner, here is a direct link, go here but remember to choose this chapter '1.1 Chokes for PS'. These are similar to the Kaneda circuit, but technically improved by Lundahl, and adapted for use with tubes. Take a closer look at this CMR circuit, and you will see there is no direct connection any more from any part of the transformer or rectifier circuit to the power supply output, other than going via the choke. Knowing a choke can not pass AC signal, this becomes a near-perfect l method to prevent power supply ground loops. It is of course only possible with dual chokes such as the Lundahl. Misc6 = Octal socket. Yamamoto or other. Misc7 = Octal socket. Yamamoto or other. Misc8 = UX4 socket. Yamamoto or other. Misc9 = UX4 socket. Yamamoto or other. P1 = 10k Log. This is optional, but recommended to use.